Eastwood Collieries’ Male Voice Choir was formed almost 100 years ago by a group of men who worked at the local collieries owned by the Barber-Walker Company. Brinsley Colliery was one of these collieries and on Saturday 20 October, it was almost as if the choir had returned home when it performed in Brinsley Parish Hall. During the afternoon, and at the invitation of the Parish Council, several local community groups commemorated the end of the First World War by presenting their own displays in the hall and ECMVC ended the day with an evening of song. Before the interval, the choir treated a packed hall with a selection of songs written in several of the decades that form their history and in the second half presented a carefully crafted programme of songs and readings to respectfully and poignantly remember the victims of war. The concert ended with the choir’s biggest and most powerful songs from the current repertoire – Bui Doi from Miss Saigon and If We Only Have Love, written by Jaques Brel. The audience gave the choir a standing ovation and demanded an encore of What Would I Do Without My Music – a song performed earlier in the evening. 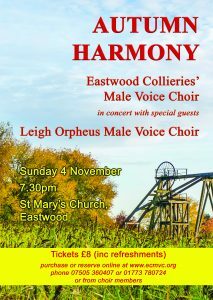 ECMVC present their final scheduled Eastwood concert of the year at St Mary’s Church, on Sunday 4 November. With special guests, the Leigh Orpheus Male Voice Choir from Essex, Autumn Harmony will once again provide a fantastically varied programme of items from two well-respected choirs. Expect many classic songs from the shows as well as popular pieces and standard male voice choir items, old and new. Leigh Orpheus are a large choir and are expecting to bring 50 choristers, so a great evening’s entertainment is guaranteed, with joint items being performed by close on 100 voices. Proceeds from the concert will help ECMVC in their preparations for their centenary year, which starts in September 2019. During those twelve months, the choir will be partnering and supporting Prostate Cancer UK as its centenary charity, so any money raised from Autumn Harmony will ultimately enable ECMVC to maximise the contributions given to charity at the end of 2020. Tickets for Autumn Harmony cost £8 and can be purchased from choir members, online via the choir website – www.ecmvc.org – by phoning 07505 360407 or 01773 780724, or emailing secretary@ecmvc.org. ECMVC’s Eastwood concerts always attract large audiences and ticket reservations are strongly recommended to guarantee a seat.